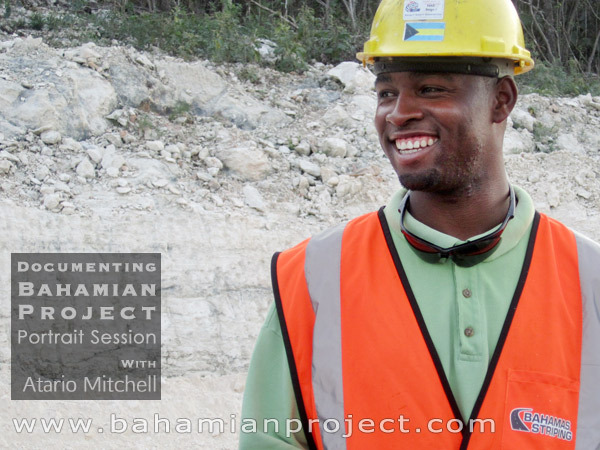 This picture of Atario Mitchell was taken right after his portrait session for the Bahamian Project. The final portrait images will be unveiled at the Exhibition Opening at the National Art Gallery of The Bahamas on July 11, 2013. This picture of Atario Mitchell was taken before his portrait session for the Bahamian Project. The final portrait images will be unveiled at the Exhibition Opening at the National Art Gallery of The Bahamas on July 11, 2013. There weren’t supposed to be any trucks on the closed road the day we were scheduled to photograph Atario Mitchell… but there were trucks, and tractors too… lots of them. I admit, I was a little intimidated by the metal monsters barrelling back and forth inches away from us and our equipment, but Atario Mitchell took it all in stride. This is a familiar environment to him. He is the president of Bahamas Striping, a road-marking company which he started when he was just 22 years old. The young entrepreneur has gained considerable recognition in the country for his achievement. He is a good example for his peers and for younger generations. Actually, he is a good example, period. What he did have was a good business idea, a burgeoning belief in himself and the gumption to act on it by applying for the Ministry of Youth, Sports & Culture’s Self Starter Program. He was awarded a $5,000 government grant to start Bahamas Striping – a company that, now three years later, will reach over a $1 million in sales by the year’s end. He is young enough that he can still empathize with the new generation of young adults and the challenges they face. “As young people, instead of forming, joining or being involved in gangs or engaging other anti-social behavior, form an enterprise. If you are smart enough to run the streets, you are smart enough to run a business,” he tells them. Atario believes in second chances. He believes in giving back to the community. He believes in empowering young Bahamians for the benefit of Bahamian society. And he has done all this. He has hired young Bahamians who didn’t have a chance anywhere else, training them, motivating them and helping to make them positive contributing members of society. That is so great….. Congratulations on ur success and inspiring others! I have followed our story for the last 3 years, you are doing well for a young man. Keep up the great work.